As the model world keeps evolving, we have begun to stray away from attempting to define perfection. After models have broken moulds and barriers of what 'the public wants', emotion and a sense of reality have started to simmer back into fashion and the industry. Now, we're after something bigger than just an airheaded model; we want the good stuff on the inside, too. After models' statuses have become equivalent to movie stars and pop singers, personalities have opened up to the public; and it's resulted in only models with substance and quirk have acquired the love from the public. No one cares about a 'fitspo' picture or Karlee Kloss holding hands with Taylor Swift. We want something more. 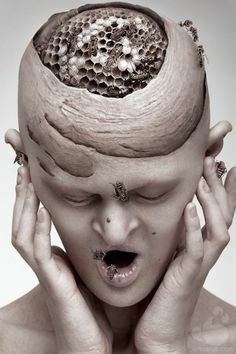 Melanie Gaydos is everything more plus more. Not only does she have an exquisite killer look, but she also has an unparalleled personality to match. 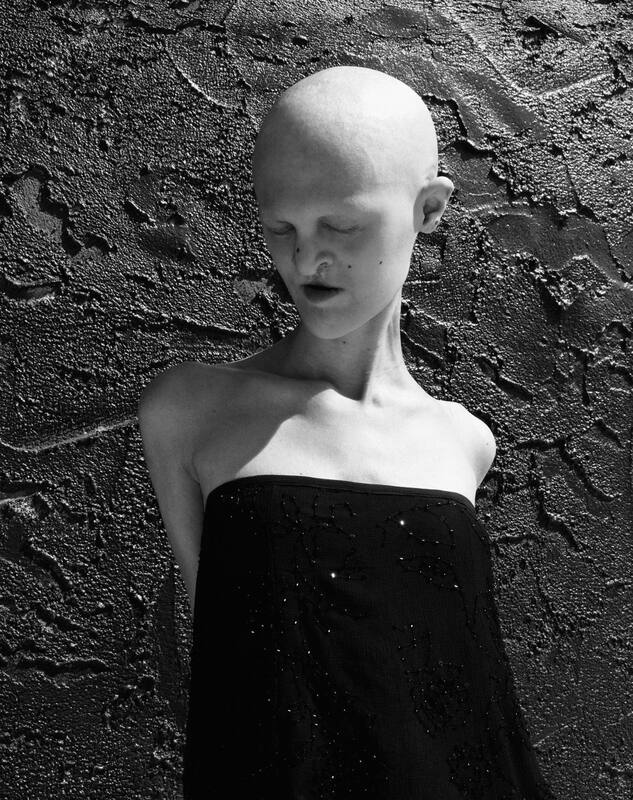 After she was diagnosed with ectodermal dysplasia, resulting in baldness and absence of teeth, she used it to her advantage and took the plunge into modelling. Throughout her career, she's shown us how strong and innately authentic she is. Refusing to wear dental implants and embracing her look, Melanie projects herself exactly how you see her. Yet, she still has more to offer: her acting. After shooting the Third Sister, Sparcity, a sci-fi thriller, Rammstein, and the Lost Penny - amongst others - she's proven herself talented and true in every regard. We were lucky enough to chat to this Connecticut native about all things Melanie, modelling, and more. You are truly one of the coolest people we know. We don’t even know where to begin, but we’ll definitely be sure to keep the cliché interview questions to a minimum. I think my own uncomfortably with the way that I felt about myself gave me the push to start modelling. I started modelling after a pretty difficult transition phase four years ago. I didn't feel very positive about myself or my life. I kind of felt like I had hit a plateau and needed to feel something different. I found out through trial and error that the only way to do this was to look inside of myself. I modeled for my own portraiture and art before. I guess I felt like I wanted to feel that way all of the time, and to not be so secluded in my artwork. I wanted to branch out and make a stand for myself in the world that was larger than what I was doing at the time (my own artwork). I am an artist at heart, and modelling is what I am doing now to express myself. I've always felt very rebellious from how society saw me or what society thought I should do. I am told everyday still what I can and can't do, even while I am doing all of this!!! I understand it doesn't come from a negative place (most of the time). People are just sharing with me their world all and what they've seen. I want people to really take a step forward within their life and be more proactive. The opportunities are limitless, in every moment that passes. I feel this strongly within myself. I think the first step forward was the most difficult. Now I can jump and skip with joy haha. What is your favourite acting or modelling experience you’ve had thus far? My most favourite acting and modelling experience so far was working with my dream photographer Tim Walker quite recently. It is a secret project but will be released soon during the winter months!! He was the first photographer I found that I could not contact or get a hold of, due to me being without an agent and him being with one. I name dropped him in every interview "who would you like most to work with" and said his name whenever people asked me who I'd like to work on a certain project with. Finally it paid off and he reached out to me. Before shooting with Tim, working with Eugenio Recuenco was my most favorite acting and modelling experience. He was the first photographer that actually introduced me to high fashion through his fairytale editorials when I was 11 or 12. When I first started modelling I wrote to everyone I wanted to shoot with and sent him something like a fan letter. Haha I couldn't contain myself, I loved his work so much. And much to my surprise he wrote back to me and asked if I was available to shoot a music video in Germany. I started modelling just a few months earlier so this was a huge launching point for me. 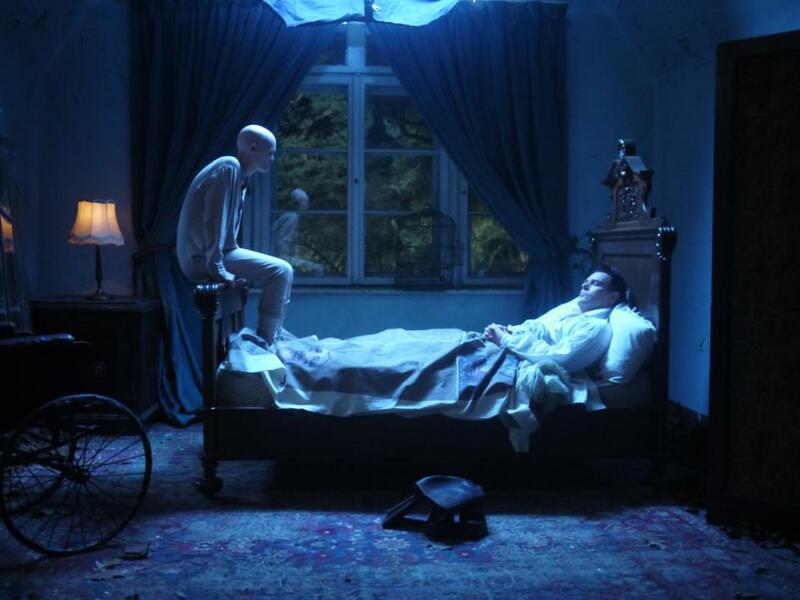 Both internationally, in the band Rammstein's "Mein Herz Brennt" music video and psychologically. It was the first big production I had been on and first time on a plane by myself and out of the country etc. I had an amazing time and just knew, shooting in production is where I was meant to be. Which photographer listens to the best music to model to / who’s your favourite music artist/group? My good good friend, Christian Martin Weiss, listens to the best music while shooting and also secretly Tim Walker. Although usually the music ends and we are so entranced in shooting that we don't even notice the silence. This is the best actually for any shoot! Mood music definitely helps. I'm so into mood and ambiance for the shoot it really has to help inspire me otherwise it's annoying and just a bother. I'd rather there be no music so we can focus etc. When I am not shooting I love listening to the radio top hits for pop and hip hop haha. Lately I've been loving the Weeknd, Future and Drake. I go through periods where I'll only listen to one thing. What song do you secretly sing at the top of your lungs in the shower? Ahaha I get these jingles stuck in my head, such as the Folger's theme song. Disney theme songs from the Little Mermaid, Pocahontas or Beauty and the Beast. Or Cher, and especially Fleetwood Mac. For the most part I just make up songs and sing to my cat Tigger who likes to sit outside of the shower and play with me through the glass. What’s your favourite part about NYC? I love that everything is so accessible, I can walk or take a train anywhere. There is so much to do, I wish things were open 24 hours like how it supposedly used to be!! How do you find people respond to you in the modelling industry around the world? Around the world, the response is typically very positive and strong. Actually it took America up until the end of last year to really start digging what I do. It's also around the time I started to do more personal interviews and share my story with the world. I think before this people were really stuck in the world that they knew and many people loved what I was doing but I honestly do not think they were ready for the change themselves. I've started sharing my story and living more "out loud." I think my interviews reach people on a more human level, since my modelling work has been pretty "fantastical" or out there. I think a lot of people are comfortable within their little bubble or box, and I just keep doing my thing regardless. Some people are scared they may not be ready, I'm trying to say there is nothing to be afraid of. What’s your favourite place you’ve travelled to? What’s the best New Year’s you’ve ever had? I have yet to have an amazing New Year's. When I was younger New Year's with my family was always fun because I got to stay up late and watch the ball drop on TV with some sparkling apple cider (still a fave haha). Maybe the next New Year's will be amazing. Chai latte, fruit infused sparkling water, and if I'm already drunk then everything. Well my bf would say cookies, cakes and pies. But I say... cookies, cakes and pies haha! I really love breakfast pastries for sure. My style changes a lot, but Free People is usually a staple and I am dying for some Wildfox Couture because I want to cuddle and live in a flower garden forever. My kitten Tigger is legit my spirit animal. He is about ten months old and embodies my personality for sure. Spunky and independent and he loves to play and be cute. I love animals a lot haha. I am drawn to anything with a personality, whether it be my gargoyle gecko named Mouse, or my Jesus baby - parthenogenic leachianus gecko named Pickle. I recently met a little white barn owl that I wish I could keep as a pet!! I look up to anyone with an open, strong and kind heart. My boyfriend is kind of amazing and always inspires me to be a better, more positive and open minded person. If you had a bumper sticker on a car, what would it say? Cookies, cakes and pies or reality TV. How do you wind down after a hard day’s work? Animal and boyfriend cuddles, pyjamas straight away and maybe reality TV to take the edge off. Is there anyone you’d really like to work with in the future? 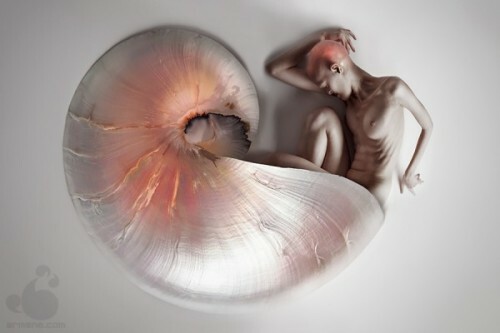 I would love to work with Nick Knight!! At the moment, I am learning about lingerie and swim suit modelling. It's something I've never done before and I think is a super "middle finger" to society and their beauty standards!!! More importantly, it is a personal challenge for myself. Check Melanie - our ultimate Woman Candy Wednesday - out on her social channels.